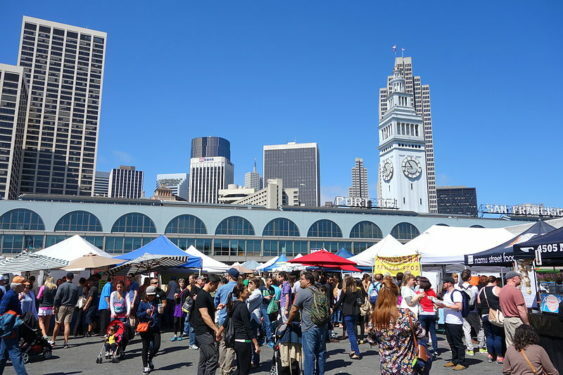 This waterfront market, run by the Center for Urban Education about Sustainable Agriculture (CUESA), has over 100 food, fruit, and vegetable vendors on Saturdays and the entire Bay as its beautiful backdrop. The Ferry Plaza Farmers Market operates year-round from 8 am to 2 pm. On most Saturdays, free cooking demos take place in the CUESA Classroom (under the white tents in front of the Ferry Building) and are free to the public, with recipes and samples for all. Evan Bloom started cooking younger than most, eschewing Kraft mac n cheese for Thai cuisine & baked Alaska. This love of cooking and food stuck with him through college, and after studying architecture and joining the corporate world, he eventually found his passion was behind the stove. Going back to early memories of surly waitresses and onion rolls at the now-closed Rascal House in Miami Beach, he realized his fondness for food had roots in Jewish soul cooking. At Wise Sons Jewish Delicatessen, he recreates classic dishes with integrity, using quality ingredients while still hitting the proper nostalgia that would make your Bubbe proud.